Published: Aug. 25, 2018 at 05:48 p.m.
Houston Texans wide receiver Braxton Miller skies over two defenders for a 7-yard touchdown. Published: Aug. 9, 2018 at 09:36 p.m.
Houston Texans quarterback Brandon Weeden throws to Houston Texans tight end Jordan Akins for a 14-yard touchdown. 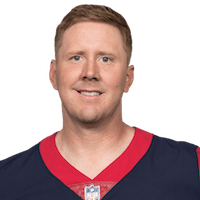 Published: Aug. 9, 2018 at 09:10 p.m.
Houston Texans quarterback Brandon Weeden throws to Houston Texans tight end Jordan Akins for a 6-yard touchdown. Published: Sept. 1, 2016 at 09:28 p.m.
Houston Texans QB Brandon Weeden completes deep pass to wide receiver Keith Mumphrey for a 64-yard TD.